Storm water refers to weather generated water, rain, snow, ice/snow melt, etc. Storm water that is not absorbed by the ground becomes surface runoff. Surface runoff either flows directly into surface waterways or is channeled into storm sewers and eventually ends up in the surface waterways. There are two major concerns with regard to storm water, the volume and timing of runoff water (flooding) and the contaminants that the water is carrying (pollution). Storm water is also a resource, as the world’s population increases so does it’s need for readily available water. Today technologies exist for storm water harvesting, along with point source water management and purification this can lead to urban environments with self sustaining water systems. Quantum Environmental Enterprise is a technology leader in storm water management, control and harvesting! Following are terms and techniques to help you understand Storm Water Management. 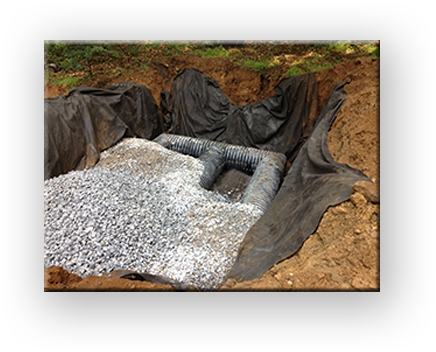 Quantum Environmental’s Infiltration Beds are constructed to provide an irrigation bed where rain water is retained long enough to allow it to be absorbed slowly by the earth. Dry Wells are simple underground structures that retain and dispose of unwanted storm water, they are designed to prevent water runoff. Rain Leader Conductors are used with roof plumbing to capture storm water runoff from the rain guttering. This water can then can be used for lawns and gardens or disposed of in a controlled managed flow. Retrofitting refers to adding new technology, upgrades or features to existing older systems. Quantums experienced personnel will explain your options be it, repair, replace, upgrade, retrofit we will help you make the decision that works for you. 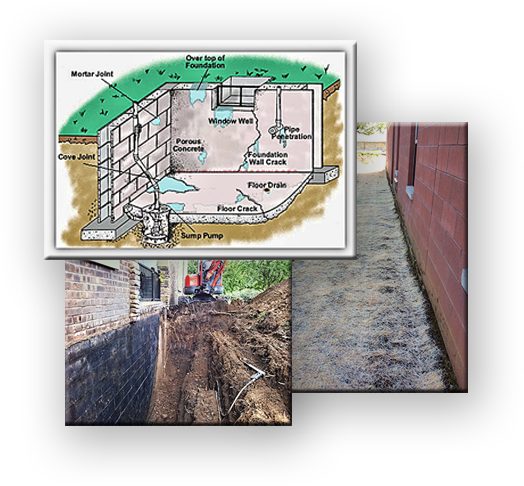 Wet basements have many causes, from roof water to foundation and grading problems, with extensive experience and the right equipment we diagnose and get the job done right. Your dry! Rain Water Harvesting is a technology whose time has come. 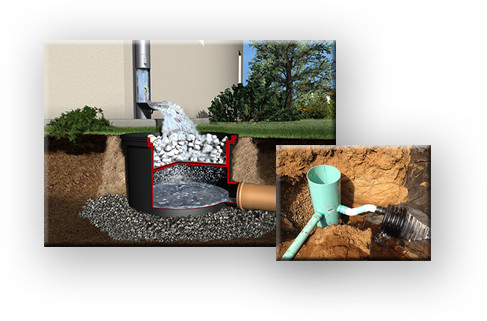 Quauntum specializes in the design engineering and installation of collection systems that will retain the rain water and reuse it for lawn and garden watering systems. Hydrants can be installed right at the garden for convenient use or hooked directly to your lawn watering system. 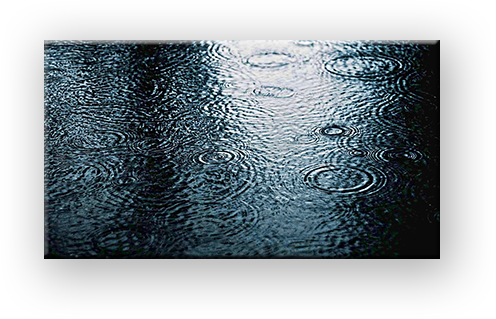 Rain Water Harvesting saves time, money, and makes good use of the rain water resource. With ever more progress and development in our surrounding area the natural terrain is being changed. Water erosion control has become an important issue! 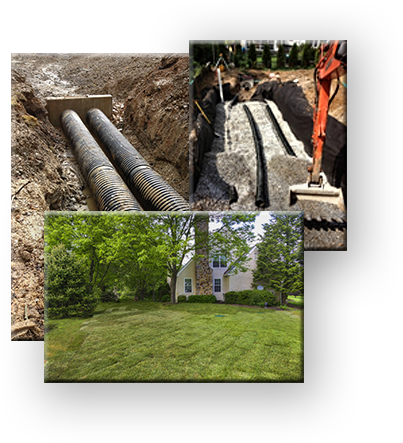 Quantum’s team handles the whole job from excavation, Changing the water’s direction, installation of retaining/sewer runoff systems, to planting seed and sod to keep the earth in place. Quantum provides Inspection, maintenance and replacement of filter medium such as sand or gravel. Ensuring removal of petrolem products as well as other pollutants. Often becoming clogged with debris and other pollutants that drain from roadways and parking lots these water transport/drain systems become empacted resulting in flooding. Regular inspection and removal of debris greatly reduces this risk.